In a yoga for scoliosis training I took last year with Elise Browning Miller, I sat in a room with twenty people, mostly yoga teachers and physical therapists, with varying degrees and different kinds of scoliosis. I’ve had a one-sided lower back pain for a few years now, and it seems to be getting worse. I realized something was a little off this year because no matter how much I stretched the “tight” part, the pain didn’t go away – it even seemed to make it worse. At one point Elise explored the unique architecture of our backs by having us take turns in a modified uttanasana, folding forward, shoulders hunched. When it was my turn she joked that yoga teachers at her workshops often get “scoliosis-envy” and think that they have it just because everyone else in the room generally does have it. Then she asked me to fold forward. This is when I discovered I have a little sidewinding back… a very minor S-curve. Breathing into the concavity (the inward curving or sunken side) is a great way to begin to build dendritic connections and awareness of differences between the two sides. You can stretch the concave side of thoracic curvatures in asanas such as child’s pose by stretching to the side of the convexity (the side where the lungs are already expanded). Anchor the lumbar spine by fully releasing the hips to the heels. This will naturally place the lumbar in gentle traction which is good for anyone. With the hips down, begin extending forward from the lower ribs and now move both fingertips a few degrees to the right or left, depending upon the curve (right thoracic would move to the right, left thoracic to the left). Staying up on the fingertips keeps the arms fully engaged and allows the ribs to expand more. From there, send the breath into the concave side. The lungs on this side typically receive less oxygen due to the structural imbalance. Learning to breath into and expand the concave side can begin to influence this imbalance. I loved that Elise emphasized the importance of cuing breathing as the breath is often a neglected distant cousin in your typical alignment-based Iyengar class. A new tadasana: Loved this little self-assist with strap: loop a strap across your back under the armpits, up and over the armpits at the front, then cross the strap at the back. Find the strap ends by reaching for them at about lower-rib height and pull down. Delicious! On a side note: I love exploring the many variations of tadasana across different schools of yoga. Tadasana is a foundational posture in most traditions, and each has its own particular way of cuing and aligning the body. If you are accustomed, as am I, to aligning your I feet hip distance apart with the inner edges parallel (common in the Kripalu tradition, among others) try the Iyengar way. In the Iyengar tradition, the outer edges of the feet are parallel (this is often cued by having students align the outer edges of the feet parallel to the edges of their yoga mat). After years of spreading my toes (big toes toward each other, pinky toes away) and aligning the middle toes to face forward, this variation makes me feel awkwardly pigeon-toed. It does naturally brings a great internal rotation to the upper thigh and a spreading of the sitz bones… but in the end entrenched patterns prove too difficult to overcome (plus my knees kind of hurt after a few days of it) and I’m back to my old familiar mountain pose. Learning to differentiate between moving and stretching the lumbar versus the thoracic spine. This is easiest to explore in a simple asana like standing side opening stretch. Start in tadasana. To emphasize only an opening in the thoracic vertebrae, keep your hips aligned directly over your ankles and reach up with your arms as you lean toward one side and then the other. Imagine that you could stay between two panes of glass, or as my friend Sarah at JourneYoga likes to say, in a toaster, taking care not to burn your edges. In order to emphasize a stretch in the lumbar spine, reach your hips out to the left and lengthen up and out from there. This will create a fuller “c” shape and lengthen evenly through more of the back. In order to limit thoracic opening as you emphasize the lumbar, neutralize your arms by keeping your hands on your hips or reaching behind your back to clasp opposite wrists, forearms or elbows (depending upon flexibility). Everyone in the scoliosis world is always concerned with twists. According to Elise, twisting is OK so long as there is no corresponding hunching. Twisting minimally is safe so long as the emphasis is always strongly on creating length primarily. Students with scoliosis will often hunch to twist. If you can encourage your students to create length throughout their very gentle spinal twists, you will help them to build flexibility and suppleness across each joint. Granted, most students with scoliosis will want to spend more time twisting in the direction that de-emphasizes their already pre-existing curve. How that works depends upon particular curves, apexes of said curves, and is beyond the scope of this post. Headstand is not ok. This was the only asana she brought up when I asked specifically what postures should not be done by students with scoliosis. Handstands, especially L at the wall, are great for building strength equally across both shoulders. Elise showed a modified headstand where the shoulders rest on two chairs and a couple of blankets. There are so many ways to play with inversions without a ton of props and get all the benefits of a headstand (except the benefit of putting pressure on the crown of the head) that the two-chair method isn’t one I would adopt myself. One thing I’m sold on is the rope wall… I’m getting one for Pavones Yoga Center asap. Everyone in class loved the feeling of expansion from hanging upside-down or exploring down-dog with the ropes. I haven’t been to a doctor to receive a full x-rayed diagnosis. I don’t even like to label what I might have as scoliosis. As it is, I’ve found it’s difficult not to make constant adjustments and over-compensations, not to obsess about posture and end up over-correcting what is actually a very minor imbalance. So far, the biggest lesson for me has been in learning to accept the nature of my spine. Let it tell me a little story about myself, about the tendency of my nervous system to meander instead of taking the straight and narrow. To use this as a metaphor and gateway into my own personality. To allow the hidden wisdom to unfold from there. To realize that I sometimes stretch what hurts instead of letting it be, and sometimes the place in need of attention is the last place I think to look. Yoga teacher with scoliosis here….and I thank you for this post! 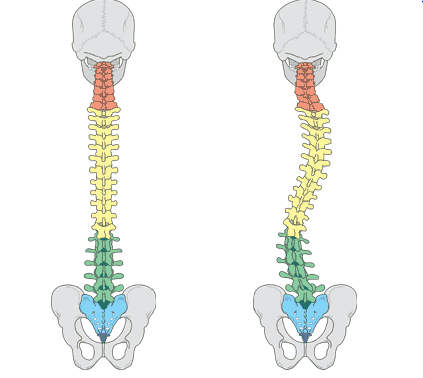 Would you expand on why are headstands are not ok for folks with scoliosis?